University student Wakamizu Ryota goes to an interview at the publishing company of his dreams, but is overwhelmed by the disagreeable interviewer. He dejectedly heads home and encounters the scene of Yanagiba Ryuichi and Hino Joji, who are obviously gangsters, attempting to get a man with a sack over his head into a car in the vicinity of his house. Then another car drives over and an exchange of gunfire breaks out between the gangsters. Yanagiba gets shot protecting Ryota who ran out without thinking. Hearing the sirens of a patrol car, the attackers flee. When Ryota tries to go back home, Yanagiba and Hino follow him �c �c Yanagiba clutches his chest in pain at Ryota�fs apartment. Feeling sorry that Yanagiba got injured because of him, Ryota tells him, �gI�fll listen to whatever you say.�h Then Yanagiba abruptly gets up and takes off his jacket. He is wearing a bullet proof vest under it and is unhurt. His name card drops and Ryota shudders to see the words on it &#8211; Yanagiba Ryuichi, the boss of Yanagiba-gumi. Yanagiba says to Ryota, �gWell, will you shelter me for a while?�h This is how Ryota ends up harbouring Yanagiba in his own home. The next morning, Yanagiba threatens Ryota, who is about to go to school, warning him not to talk about them. Ryota meets his friends and tries to tell them the situation which he is in. However, he realises that Hino is keeping a lookout and feels intimidated. When he returns to the apartment, Yanagiba has started examining the ingredients in the kitchen. He uses the leftover food in the fridge and begins to prepare a meal without asking. Ryota tries to help but Yanagiba tells him, that the kitchen is his domain. The meal is surprisingly delicious despite the leftovers that did not seem possible to combine. This is the beginning of a bizarre communal life connected by meals for a gangster and a university student. Light entertainment, if something involving yakuza can be light. 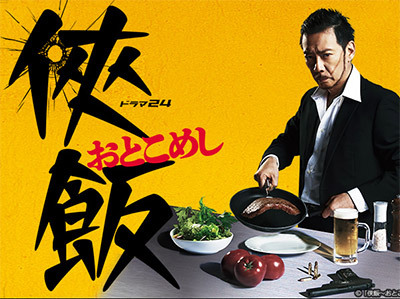 Katsuhisa Namase plays a yakuza boss hiding out in Tokio Emoto's apartment. Emoto was very good as the job seeking college grad, always a little bit slow figuring things out. Nice twist at the end, and some nice eats too! Great music soundtrack to make viewers excited over the yazuka chef's cooking. I must confessed I skipped most of the stories and zoomed in to his cooking. I have tried putting my tuna over the stove and adding lemon to it. Oiishi! The food in the drama looked so delicious!